Again, I've been lax with my poor untended blog. I've been very busy of late, with studies, research and now, being president of Macquarie University Biological Society (MUBS). We've launched a new website and newsletter, mRNA. If you're interested in biology, I hope you'll go and take a look! As well as these innovations, we're planning monthly lunchtime biology talks and a competition and exhibition of biology photos taken by students and staff in the faculty. I'm now also on the Macquarie University Biology Museum Advisory Group, looking at upgrading the museum. Exciting times ahead! As the weather is warming up, and we're finally having some good rain, the garden is taking off. Finally, many of the plants that I put in when we moved here are tall enough to avoid the chomping teeth of the wallabies. Because I've been mulching and watering so much, it seems that the invertebrate life in the soil has become utterly irresistible to the Brush Turkeys and Superb Lyrebirds, who every day kindly "aerate" the soil. We're constantly having to shovel mulch off the paths and back onto the garden beds. 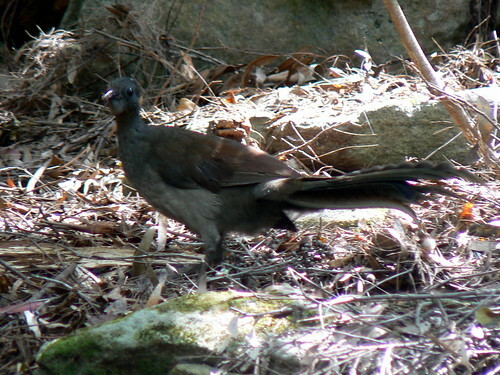 A Superb Lyrebird, Menura novaehollandiae. It's hard to get a good shot of these, as they're so timid. This one appears to be a juvenile male, with its elaborate tail plumage beginning to develop. There's been a lot of lyrebird courtship going on, with males pursuing females through the garden and wooing with their extraordinary repertoire. I completely forgive them for the damage they do to the garden. Their presence is, well, superb! 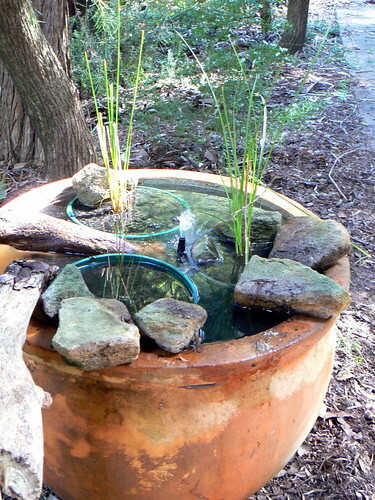 In addition to our old pond, we've added another frog habitat: a large, sealed terracotta pot. I've planted some emergent monocots in it, hoping to attract another species of frog, the Eastern Dwarf Green Tree Frog, Littoria fallax. As these plants grow, they'll conceal the plastic pots, and I've planted some densely growing plants around it, to provide protection. The pump is solar powered, with a solar panel on the roof in one of the few spots at our place that gets regular sunlight. 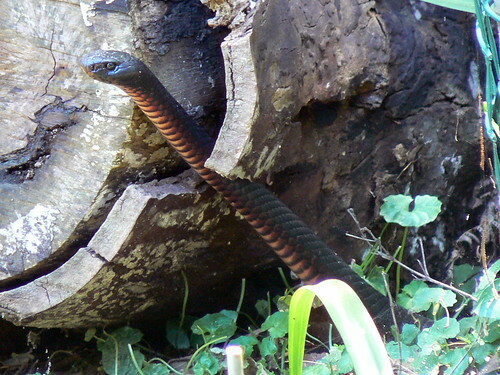 This is a new visitor to our garden, a Red Bellied Black Snake, Pseudechis porphyriacus. It's around 1.5 metres in length. Although venomous, it's a cautious species and so I'm not too concerned about its presence. The frogs might be though! My end of year exams will be over in around a month, and I hope to spend lots of time in the garden and blogging, so I'll see you then!